Air Force Academy Cadet Wrote Slur Outside His Own Door, School Says : The Two-Way The epithet was written on message boards outside the rooms of five black cadets at the U.S. Air Force Academy's preparatory school in September. The U.S. Air Force Academy has completed its investigation into an incident of racist graffiti on campus. 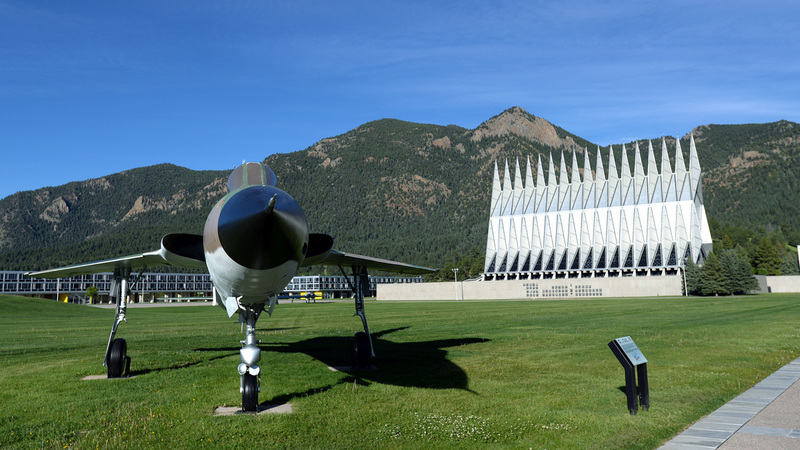 The school's terrazzo and chapel are seen here in Colorado Springs, Colo., this summer. The Air Force Academy says a cadet whose dorm room was marked by a racist slur this fall is also the person responsible for writing the message. The incident had prompted the academy's leader to deliver an impassioned speech about inclusion and tolerance. The epithet was written on message boards outside the rooms of five black cadets at the U.S. Air Force Academy's preparatory school in September. As we reported at the time, officials suspected one individual may have been responsible, based on handwriting consistencies. "The cadet candidate is no longer a student at the prep school," the Air Force Times reports, citing Lt. Col. Allen Herritage, the academy's public affairs director. After the racist slur appeared — along with the words, "Go Home" — Superintendent Lt. Gen. Jay Silveria gathered all 4,000 cadets in a hall to hear a message of his own: "If you can't treat someone with dignity and respect, then get out." Silveria is a 1985 graduate of the academy north of Colorado Springs, Colo. In response to the new findings, Silveria says he stands by what he said. "Regardless of the circumstances under which those words were written, they were written, and that deserved to be addressed," Silveria said in an email quoted by local newspaper The Gazette. "You can never over-emphasize the need for a culture of dignity and respect — and those who don't understand those concepts, aren't welcome here." Silveria was widely praised for his speech.